CMS Energy, including our primary subsidiary, Consumers Energy, has integrated sustainable principles throughout all levels of our company. Our commitment to the triple bottom line — People, Planet and Profit — is our foundation. 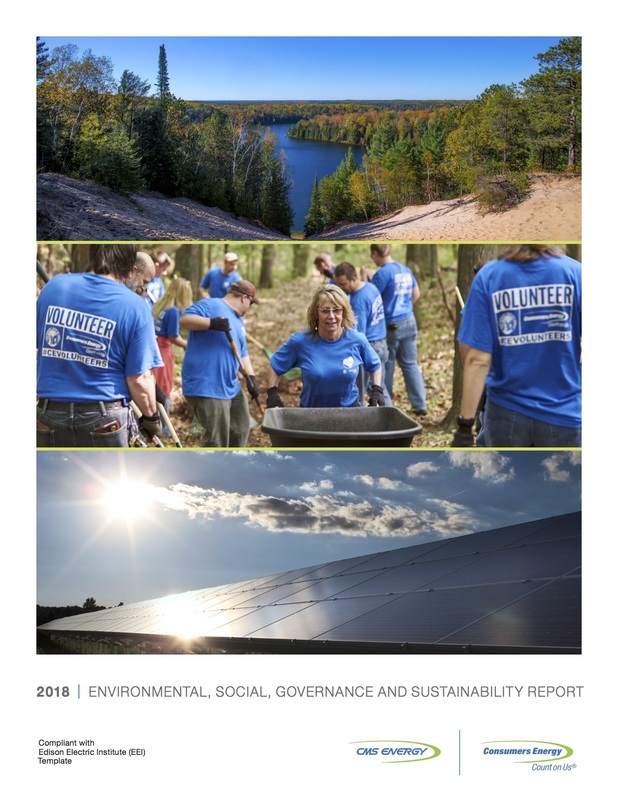 As Michigan’s largest utility, consideration of environmental, social and governance (ESG) issues is embedded in our strategy, business planning and enterprise risk management processes. These commitments align with our purpose: World Class Performance Delivering Hometown Service. The triple bottom line balances the interests of all of our stakeholders, including employees, customers, suppliers, regulators, Michigan residents and the investment community. CMS Energy is participating in a voluntary industry initiative, coordinated by the Edison Electric Institute (EEI), to provide the public, our customers and investors with uniform and consistent ESG and sustainability-related metrics. This report supplements our existing disclosure on these issues, including the 2018 Sustainability Report. Consumers Energy will also publish a Climate Assessment Report in November 2018.